Ms. Jennifer Hazelton joined the Export-Import Bank of the United States (EXIM) in July 2017 as the Senior Vice President of Communications and Marketing. As Senior Vice President, Ms. Hazelton provides communications and marketing leadership, messaging, and strategy to EXIM in order to reach its external stakeholders and audiences. Before joining the Trump Administration, Ms. Hazelton enjoyed a successful career in media and politics. She served as Communications Director for the Donald J. Trump presidential campaign in Georgia. She also ran her own public affairs firm, serving clients from a diverse range of sectors, including technology, public relations, retail, non-profit, movies and entertainment, and politics. 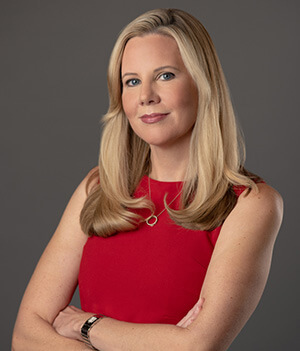 Ms. Hazelton was also a multiple award-winning Communications Director for a member of the U.S. House of Representatives, and before working on Capitol Hill, she worked as an award-winning television journalist, managing the newsroom at Fox News Channel’s Washington, DC bureau. She started her career at CNN, climbing through the ranks as a producer, executive producer, and supervising producer. She created the successful CNN International program, CNN Marketplace Middle East, which is still on the air today. While at CNN, Ms. Hazelton was a member of the team of producers awarded two Emmy Awards, two Peabody Awards, and a duPont Journalism Award. Ms. Hazelton holds an MBA from Emory University. She graduated Phi Beta Kappa from the Honor’s Program at the University of Georgia with a bachelor’s degree in political science. She is a native of Atlanta.